For over 30 years the Children's Film Foundation produced quality entertainment for young audiences, employing the cream of British filmmaking talent. After many years out of distribution, these much-loved and fondly-remembered family films return to the screen, newly transferred from the best-available elements held in the BFI National Archive. In London Tales, the first volume of themed DVD releases from the BFI, villains, conmen and plain bad luck are no match for plucky London youngsters. The CFF was a non-profit making pan-industry initiative, set up in 1951 by the owner of the Odeon and Rank cinema chains to make home-grown entertainment for young cinemagoers to see at the ‘Saturday morning pictures'. One of the Foundation's major contributions to the British film industry was encouraging directorial and acting talent. Michael Powell, Lewis Gilbert, Alberto Cavalcanti and John Krish all worked for it and famous film and TV names such as Francesca Annis, Michael Crawford, Susan George, Richard O'Sullivan, Dennis Waterman, Keith Chegwin, Gary Kemp, Leslie Ash, Phil Collins, Sadie Frost and Matthew Wright all started out in CFF films. Key themes of the films include adventure, mysteries, monsters, science-fiction, ship wrecks, races and animals, with regional content from Scotland to South West England. Directed by acclaimed filmmaker John Krish (I Think They Call Him John), The Salvage Gang (1958) is an affectionate tour of bomb-damaged London, featuring performances from a young Frazer Hines (Doctor Who, Emmerdale) and a cameo by Wilfred Brambell (Steptoe and Son). When four friends try to raise enough money to replace a broken saw, their money- making schemes take them on an unexpected journey through the capital. Night Ferry (1976) stars Bernard Cribbins (The Railway Children, Doctor Who) as ‘Pyramid', a dastardly master-of-disguise who plans to smuggle an ancient Egyptian mummy out of the country. When young Jeff, played by Graham Fletcher-Cook, discovers the plan, a dangerous chase via South London's Victoria Station and Clapham Junction ensues. 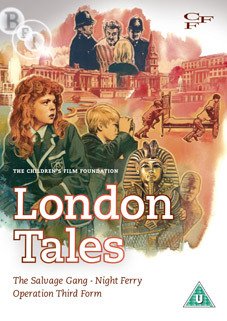 The Children's Film Foundation – London Tales will be released on UK DVD on 23 July 2012 by the BFI at the RRP of £19.99. Illustrated booklet with essays by Andrew Roberts and Vic Pratt. Additionally, on Saturday 21st July at 3.10pm there will also be a screening of The Salvage Gang and Operation Third Form at the BFI Southbank, which will be introduced by John Krish, director of The Salvage Gang, and actors Frazer Hines and Amanda Coxell.